Software development teams in practically all industries are facing fierce competition, and the need to simply deliver better software faster. To be able to do that, they increasingly turn to new methods and modern tools to streamline their development processes, increase quality, and to reduce time to market. Application Lifecycle Management platforms are tools that serve that purpose. While the benefits an advanced Application Lifecycle Management solution could bring are obvious (in a nutshell: enhanced collaboration, process transparency and complete traceability, as well as increased efficiency), choosing the one that perfectly suits your internal processes is an arduous task. 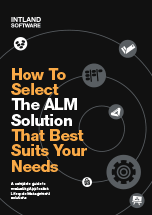 Download this guide for an unbiased overview of the characteristics, features and functions that a valuable ALM tool should offer. With a high-level architectural overview as well as a granular explanation of the capabilities any ALM solution should provide, this guide serves as a checklist that will help you identify and evaluate Application Lifecycle Management solutions, and choose the one that best suits your requirements. Have any further questions regarding ALM evaluation? Feel free to get in touch with us.